IDF takes out three terror targets in response to Gaza rocket attacks. Rockets contained phosphorous, Regional authority demands complaint to UN. The IDF blasted three terrorist sites in Gaza Friday in response to two rocket attacks earlier in the day. 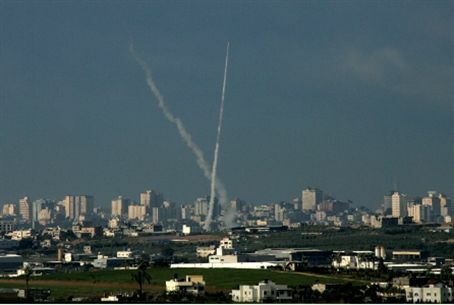 In one attack a Grad rocket was launched at Ofakim -- the first missile attack on the city in almost two years. Air Force pilots who fired on the terror sites reported direct hits. Arab media reported that six people were injured in the strikes, but did not report their identities or the extent of their wounds. Experts who examined the terrorist rockets launched Friday found that they contained white phosphorous, a material that is forbidden for use as a weapon in civilian areas under international law. Foreign Minister Avigdor Lieberman instructed Israeli ambassador to the United Nations, Meiron Reuven, to file a complaint. The head of the Ashkelon regional authority, Yair Farajun, demanded the UN intervene against Hamas' targetting of civilians in his area of jurisdiction. “This is another reminder to the international community that residents of southern Israel are forced to live in constant fear of the terrorism that takes place under the auspices of Hamas in Gaza,” Lieberman said. In addition to the two rockets, Gaza terrorists fired seven mortar shells at Negev communities. The attacks failed to cause injury. Several rockets and mortar shells fired by Gaza terrorists hit areas within Gaza. No injuries were reported.